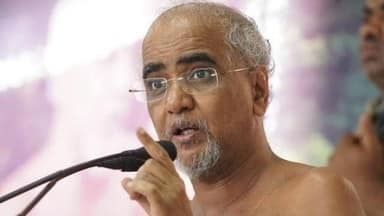 The sad departure to the heavenly abode, of the great visionary and revolutionary sage Munishree Tarun Sagar ji Maharaj is very painful for all of us. His sudden, demise at such a young age is an irreparable loss for the entire country, society and humanity, especially for the Rashtriya Swayamsevak Sangh. His famous discourse, popularly known as 'Kadve Bol' were a torch bearer for the entire society always in tune with the time. His approach was very integrative and by his behavior he used to bring together all, which would always be an inspiration for everyone. We pray The Almighty to bless us to bear this unbearable loss and that we pursue the pious path shown by him. We pay our humble tribute in his holy rememberance.